Stream of Consciousness writing is an interesting thing. Sometimes, it’s interesting to see how someone thinks, or how they make connections, and other times, it’s horrific to see where people go when they deign to think. More often than not, it’s an excuse some writers use for explaining why they have textual diarrhea (including bloggers, which is part of the appeal, oddly enough), rather than presenting a tighter narrative or analytical structure. (I’m certainly not immune to this, but then, blogging isn’t writing a term paper, either.) It’s especially interesting to see the journey from point A to point B, since the two may not initially seem connected, but following the links in the chain show how even disparate things can be connected with enough meandering. This, of course, is the appeal of the “Six Degrees of Separation” theory and the casual sport of namedropping. For some reason, people want to feel connected and important, and if they can prove even an incidental link to someone else who is more important, it seems like a little thunder can be stolen, or at least echoed. Of course, in a nepotistic society where who you know is more important than what you know, this isn’t a great surprise. It’s still potentially dangerous, shallow and stupid, but not surprising. Blogrolls can expand exponentially as a result of this sort of “browsing”. A sort of “hive mind” can form, where ideas echo around within social circles, everyone adding to the great ball of wax that a simple idea spawns. Sometimes that winds up polishing the discussion into a pearl, sometimes it just degrades into Gordian Knot, but it’s usually interesting either way. Still… I’ve got to admit, I miss the intellectual rigors of a University and term papers. I like it when things are painstakingly researched and analyzed as objectively as possible. I ramble rather extensively about gibberish here on the blog, but as my itch to create rather than pontificate has increased, so has my desire for data, rather than opinions. Extensive link browsing winds up creating a lot of mental cruft when I’m looking for hard data and incisive insight. Short story long, I was all geared up to provide another handful of links for public consumption, but took a moment to think about it. Do I really want to contribute to the static? Not as much as I used to. There’s a lot of good stuff out there, definitely… but how valuable are these little collections I come up with? I’m a bit ambivalent about them. So… back to the drawing board. Literally. I need to create, not just… graze. I love data, and I soak it up like a sponge. I’m just a bit oversaturated, and need to clear the system. One way I do that is by drawing. I’m involved in illustrating a children’s storybook at present, so I’ll be busy with that for a while. It’s not the Steampunk BattleTech art that I’ve really been itching to create, but it will be a great diversion, and a way to stretch my art muscles. Who knows, I might even dig into art creation a bit in this, my narrative dumping ground. I’m an artist by trade, and I love creating things. I grew up wanting to be a Disney animator, and my BFA degree is in computer animation. I also happen to love math, and have spent a fair bit of time as a math tutor. I grew up loving math and the intersection that it has with art in things like Origami, the Golden Ratio and Fibonacci numbers (there is a TON of math in art). I love being able to take “right brain” and “left brain” notions and use them to reinforce each other. It saddens me to see students that I tutor fear negative numbers or fractions. Math and art are both deeply inquisitive ways to look at the world around us, and both have a great deal to offer to those trying to understand life and make their cognitive functions more effective, and to each other as disciplines. Raph Koster brought “Lockhart’s Lament” to my attention, and it resonates with my experience. I managed to find a deep fascination with math early on, and I persisted with it despite my deep disgust with memorization and busywork. Of course, so-called “Investigations Math” is worse, as it doesn’t bother actually teaching anything, leaving students to figure things out on their own. The truth is somewhere in between; students need to learn how math works, but more important, they need to learn why, and how to extrapolate the critical thinking required for mathematical analysis into other aspects of life. Students need to learn how to think, not how to regurgitate. Of course this has game design applications, since that’s what I talk about around here. Game designers need to give players tools and show them how they work, then stand back and let players play. Good math is playful, good art is playful. It’s the experimentation and discovery that makes them both fun. Games are very similar; the exploration of the game functions and artistic content is a significant part of the fun that can be derived. To be fair, that’s not the only way to play (or design) games, or the only reason to do so, but it always bothers me when games quickly devolve into reflex checks or memorization hurdles. Likewise, tightly straightjacketed games with little room to explore and experiment don’t hold my interest for long. 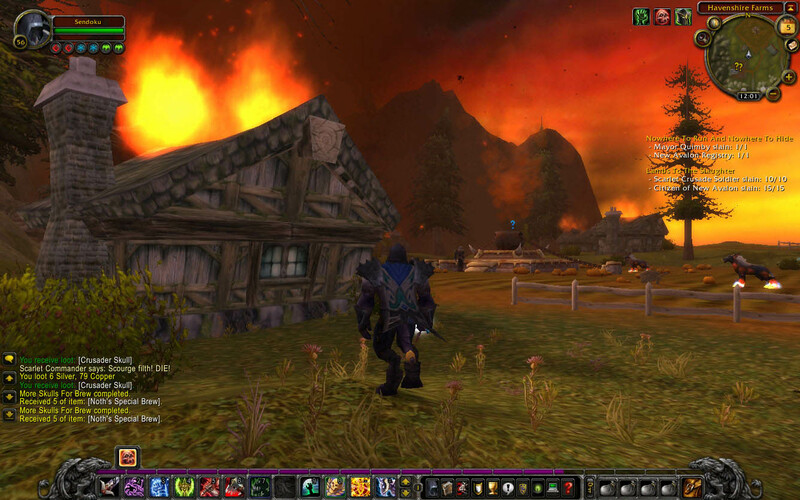 This is why level-gated games like WoW bother me; I’ve got to jump through the highly repetitive hurdles of leveling (with very repetitive combat) to see more content and get on with exploring and experimenting. I think it’s no mystery why The Incredible Machine is one of my all time favorite games, and more recently, why Boom Blox and Crayon Physics are high on my list. I wish people wouldn’t be afraid of math, or dismiss art as frivolous luxury. I suppose there’s a tangent to be run exploring linguistics and how writing and wordsmithing is similarly creative and playful while being fascinatingly structured. I do lean on alliteration and creative use of words around here, after all. Perhaps that’s best saved for another article, though. I really wanted to work these in during my I Am Become Death article, but I didn’t have them ready at the time. Also, there are a few things that I missed that I wanted to mention that these pictures can help illustrate. Most of all, though, I wanted to call attention to the last screen shot on the page, because it gives me a bit of hope for Blizzard amid all the snarkiness that I’ve perhaps unfortunately indulged in. 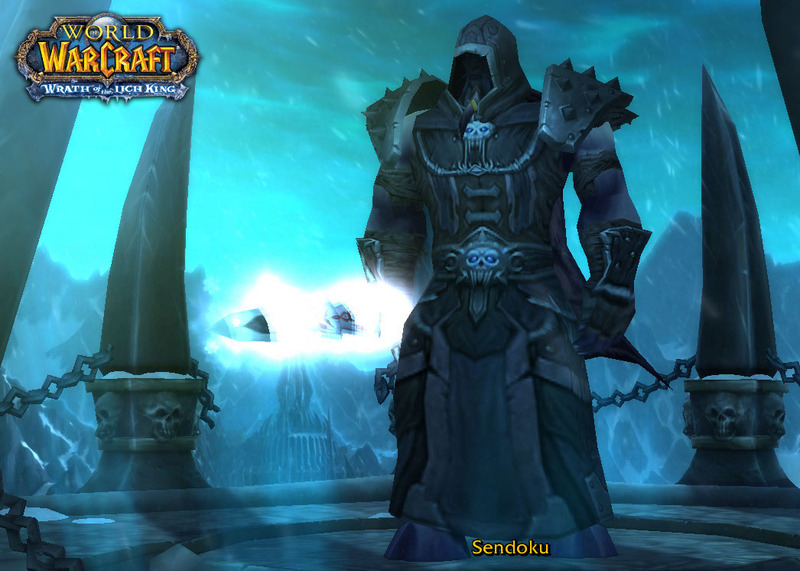 His fellow emobrood critterlings seem to like him well enough, though, and even Daddy Lich King seems like he might give Sendoku a hug someday. Early on in his tasklist for the village assault, Sendoku was told to go steal a horse, that it might be converted into a Death Charger for him to ride on. It’s an interesting bit of lore, since horses are a key part of the whole “knight” mythos, but it’s ultimately a somewhat disappointing chain of events. Sendoku ran into town risking defeat at the hands of the village defenders, angling to swipe a lovely horse to claim as his own. (By getting someone else to kill it back at the camp, naturally. Death Charger, remember?) 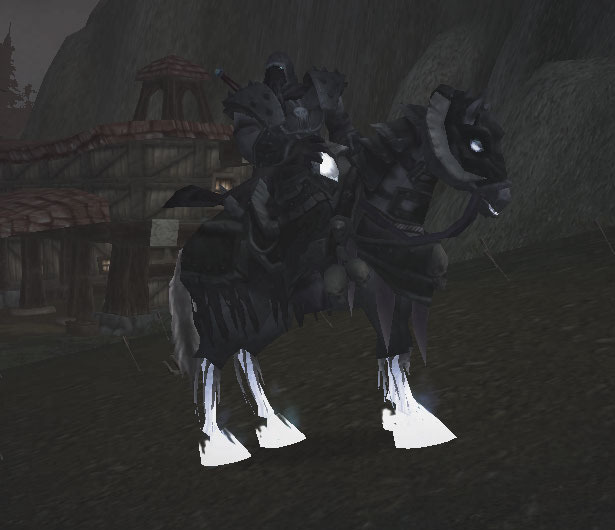 He grabbed a stark white and grey stallion, since it stood out from its more colorful brethren as a proper Death Knight mount. 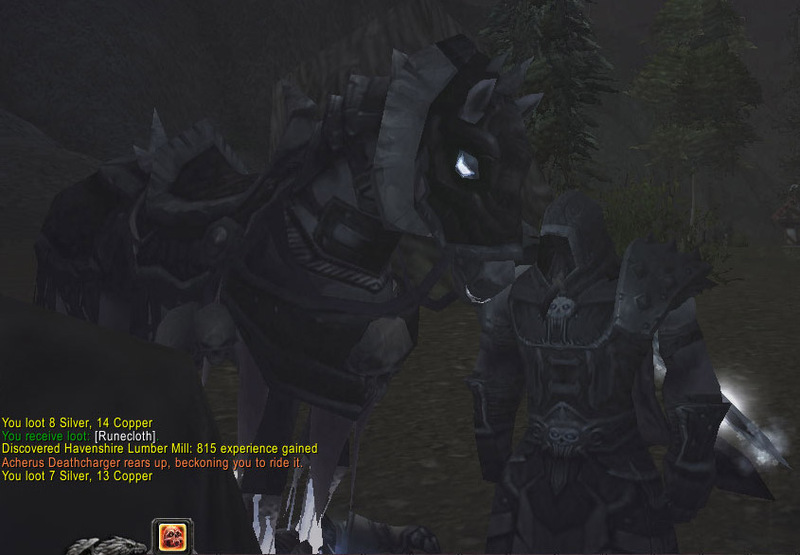 Back in the camp, the Horsemaster took the horse and shunted it into the Death Zone Shadow World (or something like that), where his minions would Necromance it in a weird Azerothian emo form of Pimp My Ride. 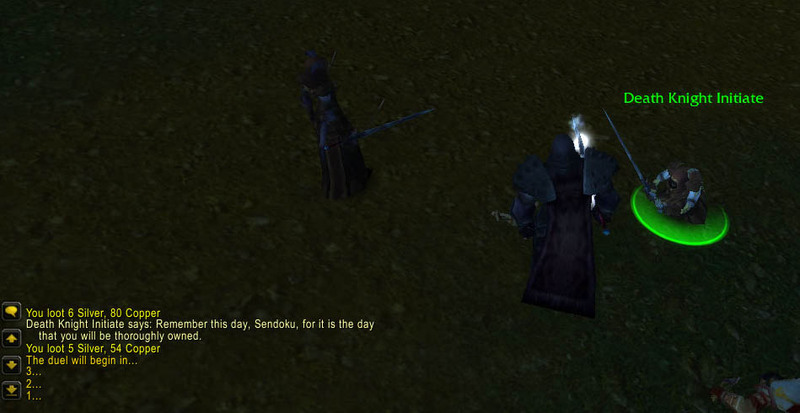 Sendoku was actually sort of looking forward to that, since that horse went so well with his armor. Upon entry into the Death Zone Shadow World, though, it was revealed that all of the horses that wound up as Death Charger candidates went through the same cookie cutter and wound up as identical equine tanks. Ultimately, it didn’t really even matter that he had brought a horse, since the first one that he captured escaped when he accidentally dismounted, and he was forced to grab another one that materialized a few dozen paces yonder. Apparently, there are plenty of critters to go around. Or maybe he just shafted another initiate by stealing his horse. Ah, well. No love lost among these brethren anyway. 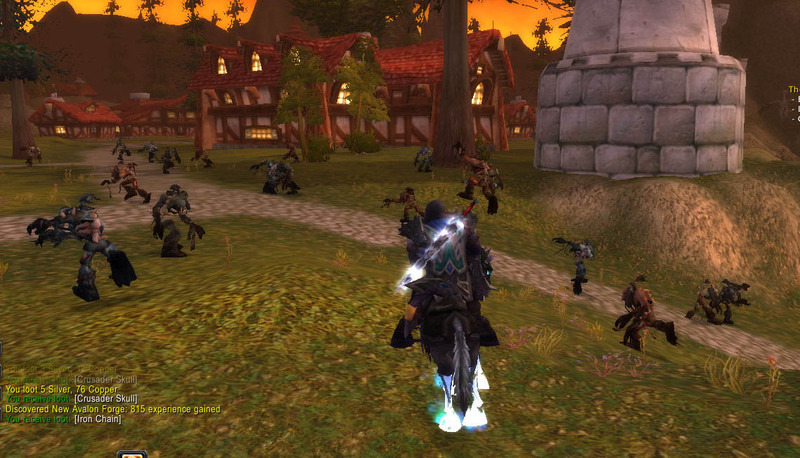 Still, it pays to look over your shoulder now and then… or have a few minions to watch your back for you. A bit later, Sendoku was charged with assassinating the curiously regenerating Mayor of the nearby Havenshire, and maybe some random citizens while he was at it. 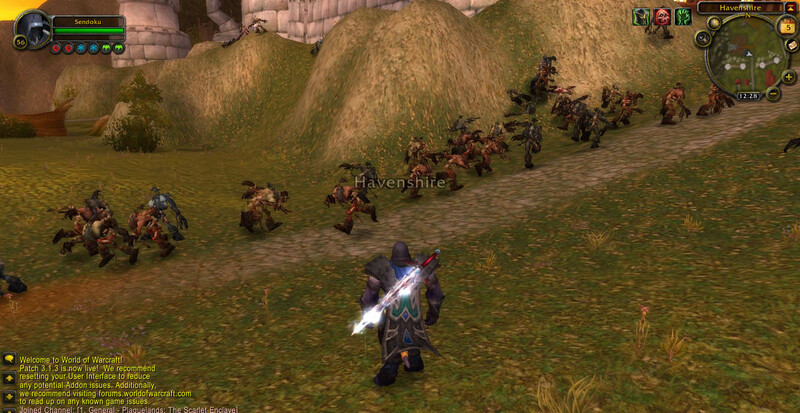 The gates and doorstep of the town were overrun by a horde (get it? Hyuk!) of ghouls, which made for an interesting sense of life by way of undeath. This is one place where I can be (sort of) serious; if Blizzard can do this sort of “incidental atmospheric life” thing without having any other players around, it undermines the “I play MMOs because they seem more alive than single player games” argument a bit. 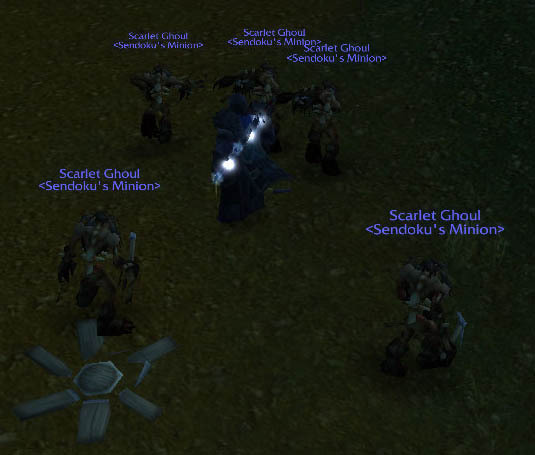 If anything, the ghoul conga line and dogpile suggest that NPC critters do the whole “undead mindless attack swarm” better than a bunch of noob Death Knights ever could, and that the completely AI-driven characters sell the storytelling far more effectively than other players. This whole DK starting questline really fits more into a single player game than an MMO, and it’s even engineered that way. Well, except for that whole “$15/month to play” thing. Speech bubbles are funny sometimes, albeit occasionally unintentionally. Context is king. Oh, and as I mentioned the tedium of Patch Day, I had to note this pair of screenshots from the patch notes. First, this note on DK abilities made the math geek in me chortle. Blizzard, you dummies, 2/4 is equal to 1/2. I know that there are a lot of people in the U.S. who have the math competency of rutabegas, but that’s still silly. …OK, OK, I know that it’s a list of two different numbers that just happen to be separated by a slash. They aren’t really fractions. It just looked odd enough to me that it cought my eye, and I grabbed a shot of it for posterity’s sake. And then there’s this little gem. 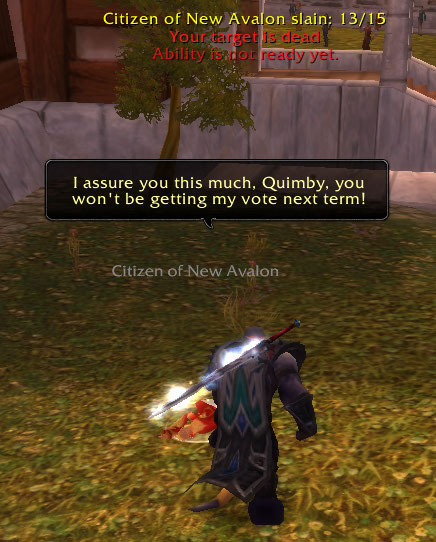 I know, it’s probably not a big deal, and it’s a bit odd that it was tucked away in the patch notes in a relatively bland, unimportant place… but that they even put this in at all suggests to me that there are still a few people with some class over in the WoW dev team. I never really did get into D&D (beyond a passing interest and a brief flirtation with Baldur’s Gate, Planescape Torment and Neverwinter Nights Diamond Edition), but Mr. Arneson did have a significant effect on gaming as a whole, and for that, he deserves thanks and accolades. I wish his family well. 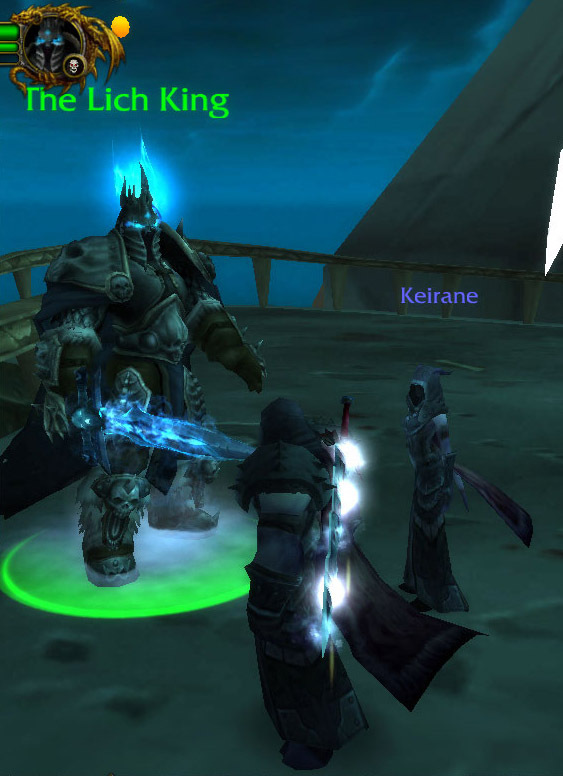 Death Knight nuttery aside, there really are real people behind these game thingies. I don’t agree with a lot of them and a lot of their decisions, but they are people, and it’s nice to see a human touch here and there that doesn’t smack of saccharine or cynicism. Yes, that’s a very punny riff on the Gou’ald name for the Stargate, the “chappa’ai”. She’s an English major, so she’s got to get it out of her system now and then. My little brother is an artist, so of course he had to chip in. Oh, and yes, I have seen the pie in person, and it’s awesome. I just wish I’d had a hand in its creation because I like that sort of creativity. I almost feel guilty for introducing my family to Stargate, considering that they have taken the fandom *coughobsessioncough* WAY past what I’ve ever done (Gou’ald logo design)… but at the same time, there’s just something heartwarming to see my siblings employing their talents and having fun with something that I happen to like too. I hope that I can do better for my children; give them the good while not sending them off the deep end. Then again, perhaps this isn’t a surprise, though. My mother did introduce us all to MacGyver, so SG-1 was a natural successor to the throne. RDA is the man. Anyway, go check out her blog. The pie isn’t the only great part about their party. This was perhaps the first game that I played extensively with a friend, and the first game that I wrote what we now call a FAQ on. Of course, it was more just a series of notes to myself for places, names and stardates, but still, that I even took the game seriously enough to take notes on it was new to my little Cro-Magnon mind. My friend even made a huge star chart out of several sheets of graph paper, complete with color coding, coordinates and racial locations. I ran StarCon2 from DOS, and even in my younger days, the nerd in me appreciated how well the naming scheme fit into the lame 8 character folder name limit. I probably still have the StarCon2.exe file on at least two older computers. The game maintains a spot of honor on my game shelf. What does it have to teach designers today? First and foremost, the game gave a great sense that the player affected the galaxy. A big part of this was the fact that time marched on, no matter what the player did, and certain “scheduled” events happened even if the player wasn’t there. That sense that “life goes on”, or that the player wasn’t the center of the universe, made it all the sweeter when the player actually managed to make a difference, like saving a species from extermination, or helping to create a new species. This, of course, gave the game replay value, as determining the best way to save everyone took a few stabs, and careful planning. In this, the GameFAQs era, such would be a matter of looking up someone’s FAQ on the game… but then, there was no such resource, so making the discovery of these scheduled events, and how to manipulate them, was a glorious thing. Much of the game was about exploration and discovery. The search for the Rainbow Worlds was one such nugget; if you found one of them by happenstance, or followed vague clues, you found a hostile world that was astoundingly rich in resources. If you dug a little more, and asked a few more questions, you could find a couple more of these gems. If you dug even more, and did a little lore diving, you would find the pattern that let you pinpoint all ten of the worlds. Again, such charting is subverted by a simple FAQ, or a few times playing through, but for the explorer content to take the game on its own terms, there were many things like this to be found. Characters would drop hints about other species, and following up on conversation trees and historical lectures paid off with clues for more things to do and see, as well as a deeper appreciation for the universe of StarCon. 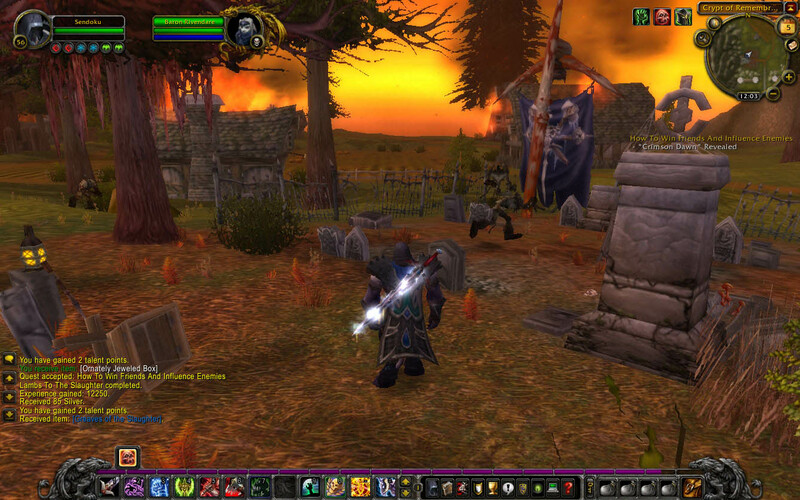 The graphics were great for a 640×480 game, with a decent and consistent UI and excellent story and character paintings. Of course it was all very stylized and cartoony, but in the age when Sierra Adventure games were the epitome of game art, it fit right in. I still miss that era, since no amount of normal mapping and pixel shader bling can make up for the sheer art competency that was required for those games to really shine. Those artists pulled off more with their limited toolset than they really should have been able to, and I respect their efforts greatly. The setting and mood were a tasty mix of high adventure in the vein of the old Star Trek (Shatner Kirk, that is) mixed with a hefty dose of humor. Alien races had clear identities and themes, with definite “voices” conveyed with unique fonts and syntax. To date, I still use the Orz term *frumple* in casual communication. It confused my wife for the longest time. If you don’t find something to like in the Pkunk, there’s a bit of your soul that is screaming for attention, you should find it. There’s also something deeply satisfying in talking a Shofixti down from using their Glory Device. Meeting the Ilwrath (aptly named) is suitably creepy, and while combat is inevitable, at least you can choose to pump your foe for information before fighting, or jump straight to insults and ordnance. First contact with these diverse aliens is usually a great bit of storytelling, and the way that you can cause interactions between the races is still something that I don’t see in modern games. 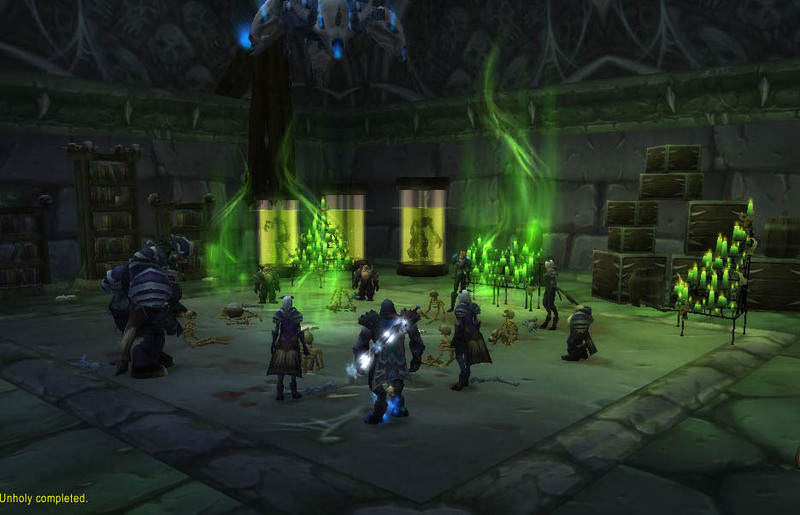 (For instance, you can manipulate some races to obliterate each other, making scavenging operations easier. Cold, but effective.) Also, talking to some aliens can make previous contacts interesting, as they are cast in a new light. The Arilou are especially enigmatic, and their interaction with the Orz can be enlightening. Oh, and tangentially? 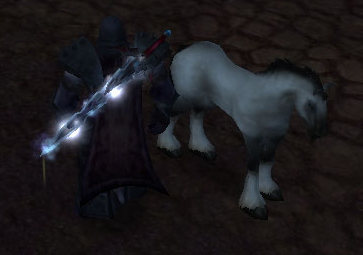 This sort of thing will never fly in an MMO. You can’t give players that much power. Single player games still rule in storytelling as a result. All in all, it’s a fantastic game, a collection of great game design ideas, rolled up in fun visuals and great writing. I’ve downloaded the open source version of the game, released in 2002, more than once now, but only recently installed it. The game holds up well, and while there are some things that I’d change about the UI (notably, the rerelease makes planetary landing much better), and the visuals are notably just 640×480, it’s still a fantastic game to play. And it’s free. Oh, and Star Control 3 doesn’t count. That game was just… not good. I’ll leave it at that. Bottom line, I can’t recommend Star Control 2 enough, and since getting your hands on it is now extremely easy (and free! ), it is one that any serious gamer or game designer should spend a bit of time with.